I’m here to proclaim my love for a particular brand of sausage. No one is paying me, I’m just that fanatic about it. If you try it, you will feel the same way. Wright’s has been making amazing pork products for years. We first fell in love with their peppered, thick-cut bacon a few years back when our friend, John, made these amazing bacon wrapped jalapenos for a company party and said, “The secret is Wright’s!” Just a couple months ago we noticed their line of ground sausage. They have a regular, hot and spicy, sage and smoked. The smoked is astoundingly good. I can’t adequately describe it so I’ll just say – go buy it and put it in everything from eggs, to pizza to pasta to your sausage gravy and you will not only gain at least ten pounds at the end of your quest, but you will be happier. At least that’s how it happened to me. 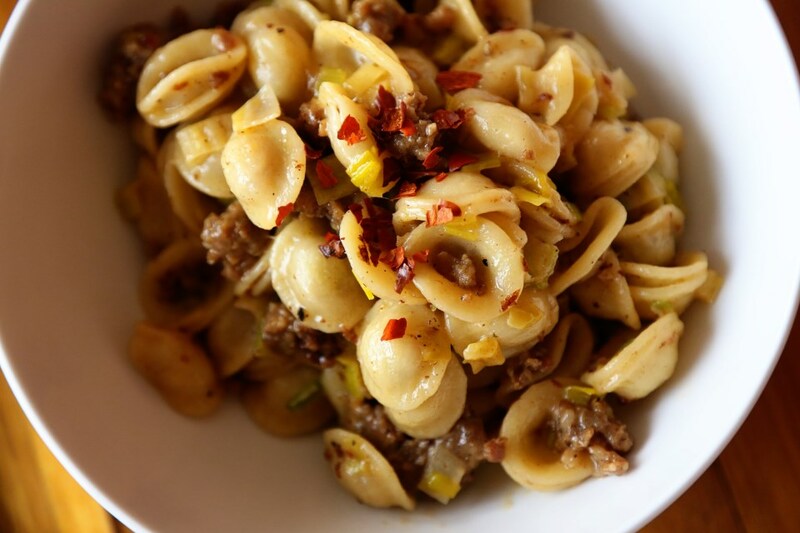 I created this little pasta dish with ground smokey sausage, sauteed leeks and crushed red pepper. A pretty classic combination but with that smokey sausage, it takes it to a new level. 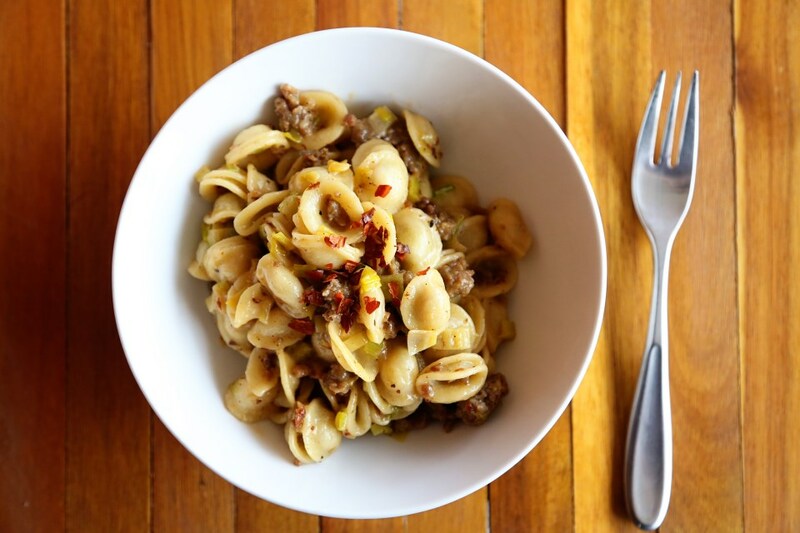 The orecchiette pasta was perfect for holding little bits of sausage and leek – this is a fast dinner that is completely satisfying and easy to throw together after work. After you try this sausage, you will keep one on hand at all times. Bring a large pot of salted water to boil. (More salt than you think – for a gallon pot, I’d say at least 1/4 cup of salt. I know – the pasta is flavored by it, it doesn’t absorb it all. Your pasta will be good enough to eat plain.) Add the pasta and cook to the package directions – usually 12-15 minutes until al dente. While the pasta water is coming to a boil and while the pasta cooks, cook the sausage, leaving in moderate sized chunks, until cooked through. Drain the sausage on paper towels and drain off all but a tablespoon of the grease and saute the leeks until starting to color on the edges. Then, add a splash of water, cover, and let steam for 10 minutes until soft. Add the cooked pasta to the leeks and fold in the sausage. Add the cheddar cheese and stir till melted. Then add the 1/2 cup of pasta water and stir until fully incorporated and everything is smooth (pasta water is an instant sauce-maker for pasta.) 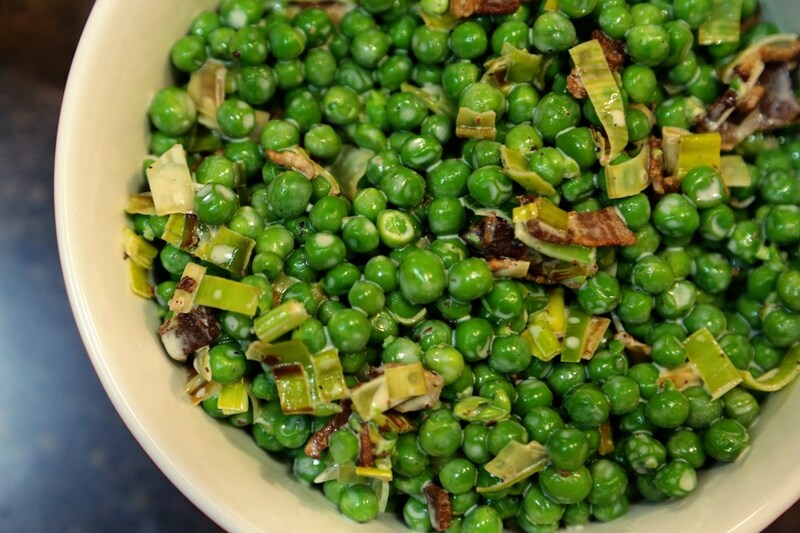 Garnish with crushed red pepper and serve! The baby ate this UP. My friend, Summer, hates quiche. The very word gives her mock dry heaves. We’ve all had a traumatic experience with some kind of food; whether it be an ingredient (dill for me, pomegranate juice for Matt) or an entire meal ruined by getting sick later in the evening, it’s hard to come back to good terms with the food after the trauma. I’m not sure why Summer hates quiche, but according to her, the description she gives is of a “rubbery filling, soggy crust, gross texture” and what comes to mind, for me, is the mini-quiches you find at baby showers the world over, or the frozen pie-sized quiches that could double as semi-wet Frisbees. Either way, it’s not a huge shock that a lot of people have a bad connotation when they hear the word. Thomas Keller is here to save the day, once again. We’ve made Keller’s quiche several times. The foundation is a good crust and so we go back to the crust I will rely on for the rest of my life – the same crust used in my strawberry pie a few posts ago. It’s perfect, it flakes, it is sturdy without being tough, and it tastes like butter because that’s the only fat used. Why look elsewhere? The key is to completely bake the crust first, with plenty of overhang so that it doesn’t shrink while baking. And I’m sorry you’ll have to buy a special tool to make it, but a 2 inch ring mold is necessary. Not expensive and if you want to really make this recipe correctly, you need one. Store bought on the left, Keller on the right. You can’t tell much, texture-wise, so I’ll tell you. And again, I’m fairly impressed with the grocery store made quiche. It’s about as good as a pre-made, American pie version gets. However, the crust was really wet and soggy on the bottom. Couldn’t exactly pick it up without it sagging, whereas the Keller quiche’s crust is very crispy and fully cooked on the bottom (you can tell by the color and how it even stands away from the plate a bit.) The Keller quiche has almost a half inch more custard and the store bought quiche’s crust tasted like sand. Honestly. Sand held together by water. It really wasn’t good. 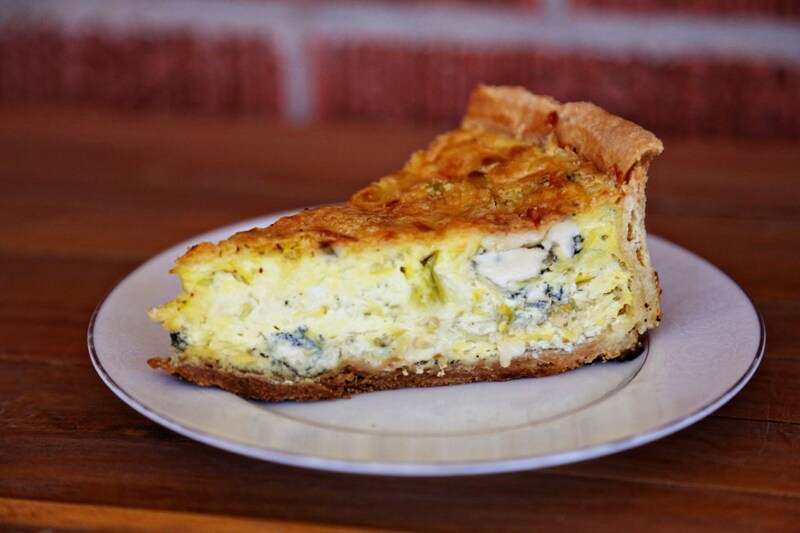 Now, the store-bought quiche’s filling was fine, taste-wise. It had bacon – how can that not be at least decent? (I could imagine a frozen mini-version would find a way) but anyway, it was a good effort, but the crust was awful and it was wet, just like you don’t want it to be. It also had that over cooked texture – kind of rubbery- that eggs get if cooked too long. I swear to you, I am not making this up, after a few days and microwaving the leftover Keller quiche, it STILL had a smooth, silky, custard-like texture. Almost creme brulee texture. It’s so darn good. Fun experiment and I would say that if you’re interested in doing something for the sake of the experiment and doing things properly, buy yourself a ring mold and get after it. 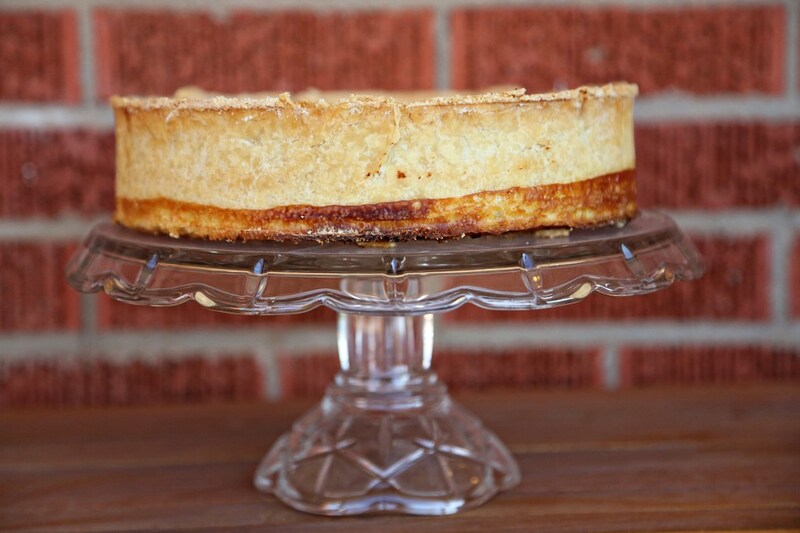 And remember – a Keller quiche takes two days. So if this is for Sunday brunch, start it on Saturday afternoon. I also want to add, for the sake of The Family Meal, that Olive ate on both quiches with much enthusiasm. Yes, even those big chunks of Roquefort. She leaned forward and said, “mmmmm!” to both. Eggs are awesome. Oh, and she also said, “Quiche” perfectly. I think because “quiche” sounds like her version of the word “cheese”. Whatever works, Ollie. Place 1 cup of the flour and the salt in the bowl of a heavy-duty mixer fitted with a paddle attachment. Turn the mixer to low and add the butter a small handful at a time. When all the butter has been added, increase the speed to medium and mix until the butter is completely blended with the flour. Reduce the speed, add the remaining flour, and mix just to combine. Add the water and mix until incorporated. The dough will come around the paddle and should feel smooth, not sticky, to the touch. Remove the dough from the mixer and check to be certain that there are no visible pieces of butter remaining. Pat the dough into a 7-8″ disk and wrap in plastic wrap. Refrigerate for at least 1 hour, up to a day. Lightly brush the inside of a 9×2″ ring mold with canola oil (or cooking spray works) and place it on a parchment-lined baking sheet. Line the bottom of your crust with parchment and fill with pie weights (our pie weights are dry beans – a whole pound of them. We just keep them for use in pies). Bake shell in a preheated 375F oven for 35-45 minutes, or until the edges of the dough are lightly browned. Carefully remove the parchment and the weights. Check the dough for cracks and patch with reserved dough trimmings (DO THIS STEP) Return the shell to the oven for another 15-20 minutes, or until the bottom is rich golden brown. Remove from oven and let the shell cool completely on the baking sheet. At this point, if you’d like to add ingredients, go for it. Be creative. We did his blue cheese and leek version and it was awesome. You simply add these ingredients (about a cup of each ingredient, chopped fine and cooked properly) to the quiche batter as you’re pouring it into the shell. Try crumbled, cooked bacon and cheddar cheese, or caramelized onion and grated swiss. The options are endless. Bake for 1 1/2 to 1 3/4 hours, or until the top of the quiche is browned and the custard is set when the pan is jiggled. Remove and let cool to room temp on a cooling rack. Refrigerate until chilled, at least one day, up to 3 days. 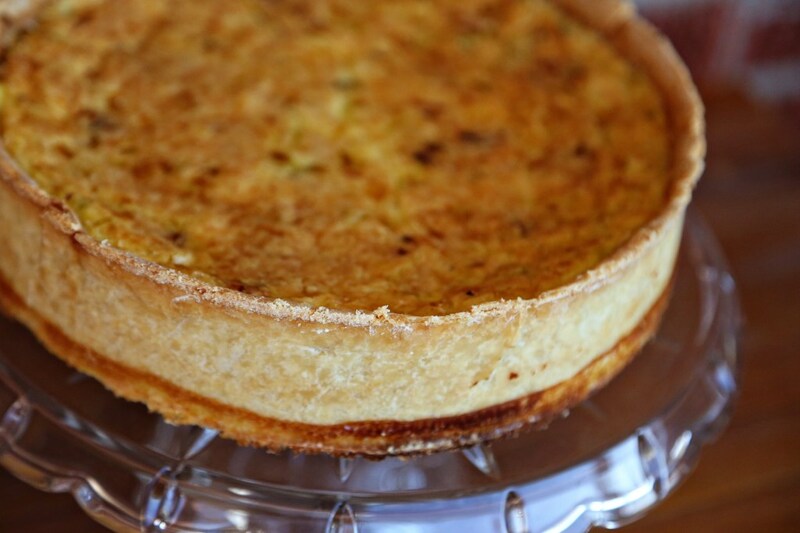 Once the quiche is thoroughly chilled, scrape away the excess crust from the top edge of the quiche. Set the quiche down and carefully lift off the ring. Preheat the oven to 375F. Line a baking sheet with parchment. 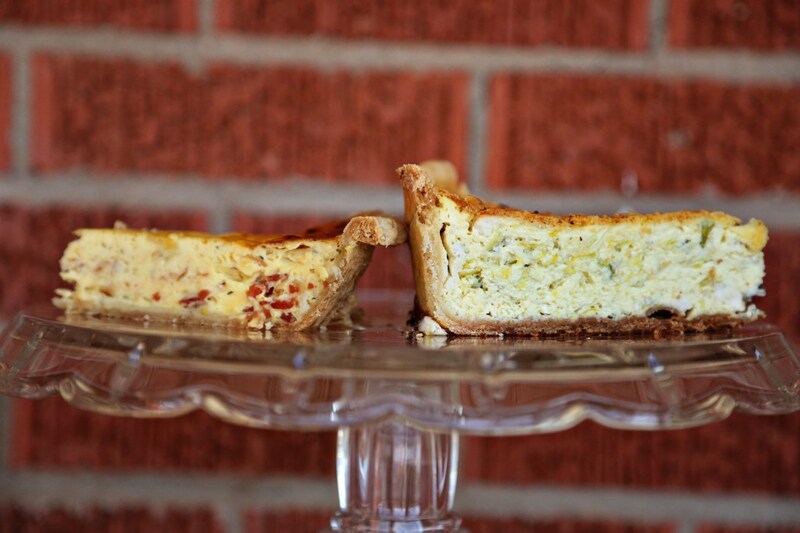 Using a serrated knife, carefully cut the quiche into 8 pieces. 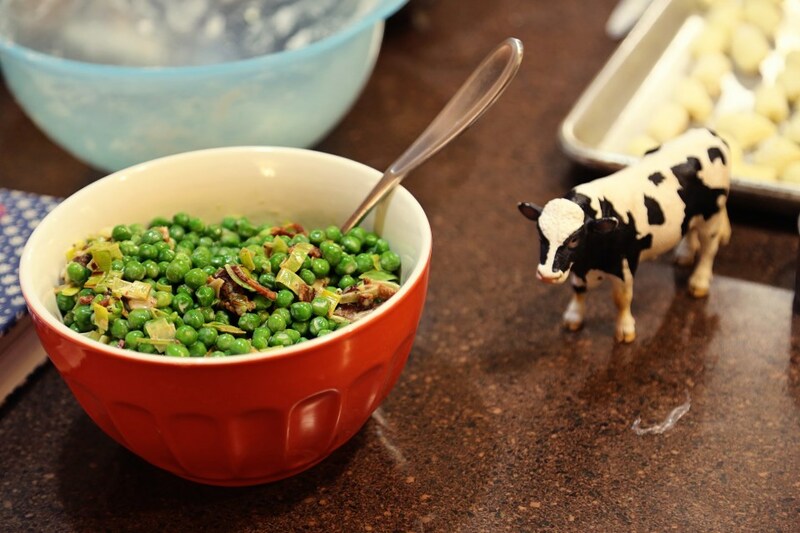 Place the pieces on a baking sheet and reheat for 15 minutes, or until hot throughout. Serve immediately.